People first began wearing braces on their teeth around 1,000 B.C., reports the American Association of Orthodontists. The association says braces can help boost self-esteem by perfecting your smile, and can also help correct poor tooth and jaw environments that can lead to health problems. But braces are not without potential negative side effects. Discuss your worries with an orthodontist or dentist to ensure braces are right for you. The American Dental Association says oral hygiene is always important but can be of utmost importance for those wearing dental braces. The braces will trap food quickly, and failing to clean the braces and the surrounding teeth after every meal can lead to considerable build up of plaque and bacteria and may lead to gum or enamel damage. The American Dental Association says you may need to limit your consumption of certain kinds of foods, like candy and sticky substances, for the duration of your time wearing braces. Some braces may include removable appliances or retainers. 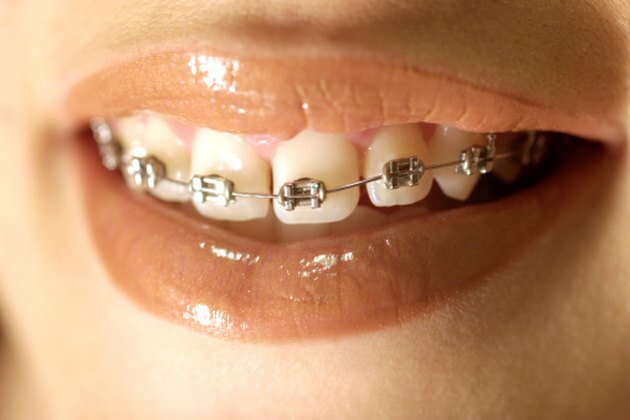 This will require extra time and care, according to the Columbia University College of Dental Medicine, as you'll have to clean it daily to avoid bacteria growth or the corroding of the metal in your braces. Braces aren't a quick fix and you'll have to wear them for an extended time for them to be effective. The Nemours Foundation estimates that you may have to wear your braces for approximately two years. Wearing braces sometimes causes the tooth's root to erode, leaving you with a dead tooth, according to the National Institute of Dental and Craniofacial Research. It's impossible to predict if, when and where this will happen, and the institute says such tooth damage can incur significant "emotional and economic costs." Braces can interfere with your day-to-day lifestyle and habits. For example, the American Association of Orthodontists says wearing braces with oral jewelry like a tongue piercing can lead to damage of the gums and teeth. If you play oral instruments such as a flute or saxophone, you may also find it very difficult or impossible to play them with braces. Braces can cost hundreds of dollars, depending on the type of braces you want your orthodontist to install. According to an Ohio State University survey, braces that are designed to be subtly obscure in appearance are considered most attractice, but often run at a significantly higher cost than traditional braces made with very visible metal wires and brackets. What Can't You Eat After Having Your Dental Sealants Placed?